There’s an all too common pattern to the beginning of an overseas assignment: a period of high excitement and exhilaration, followed by an emotional crash, known colloquially as “culture shock.” Initial feelings of elation and excitement at being in a fascinating new place may be followed by confusion and depression as you encounter one baffling difficulty after another. Once you start to figure things out, however, your emotional curve starts back up. The classic model of culture shock, consists of four stages: honeymoon, crisis, recovery, and adjustment. The “shock” in culture shock can be mild or severe; brief or long lasting. At its mildest, culture shock can be little more than a vague, free floating sense of anxiety, mild depression, or frustration. In some individuals, it becomes serious enough to interfere with normal work and life, and may require medical treatment. Table 1 provides a list of symptoms of culture shock. Although almost everyone experiences some form of culture shock, it may not hit immediately. In fact, your first few days or weeks in a new environment are often wonderful. You start by finding everything in your newly adopted country charming, exotic, and exciting. At get together with other foreigners, you can’t say enough about how much you like it here. When the search for common ground doesn’t produce the results you’d hoped it would, you turn into a student of difference. You go back to focusing on distinctions now, seeing yourself as fundamentally unlike “these people.” The differences seem less quaint and exotic now. Some of them actually seem threatening. You’re now in crisis mode, and there’s no end in sight. You’re not a tourist; you live here. You can’t just browse through the culture, as and when you feel like it: You’re dealing with all of it, all the time. You’re having cross-cultural encounters every day — at work, in the streets (where the sidewalk vendors and the kids still think you’re a tourist), in the shops and marketplaces, in schools and in offices. And although you’re surviving, and perhaps even thriving in some ways, you’re also making mistakes. The mistakes are raising your anxiety level, and the locals around you are picking up on some of your negative reactions. There’s a self-reinforcing cycle going on here, since you’re also reacting more intensely to what’s happening. A host of questions runs through your mind: “What’s wrong with these people?” “What’s wrong with what I’m doing?” And finally, “What’s wrong with me?”There’s really nothing wrong with you. Culture shock is a normal, near-universal, and actually healthy response to radical change. 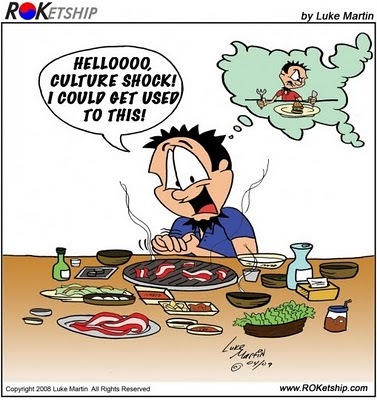 Culture shock is a learning experience, as you make the transition from one frame of reference to another. Your perceptions and assumptions are challenged, and you have the opportunity to learn and grow. The stress in culture shock, although uncomfortable, is basically a frustration reaction, and in manageable amounts, stress can actually improve learning and awareness. Managing the stress begins, therefore, with understanding why it happens. This adds up to a situation which literally does not make sense. Social interaction within any culture is a kind of mutually organized performance requiring a high degree of skill. Social encounters across cultures often resemble plays in which at least one actor does not know his lines. The adjustment process demands a reordering of daily behavior habits in subtle ways which might escape conscious awareness, such as different uses of the same work, different status symbols that must not be insulted, different traditional values that must be recognized or different views on the importance of personal relationships. 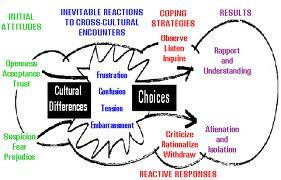 These conflict with culturally related behavior habits that can be extremely difficult to change. As you’d expect, the points of greatest stress will probably involve your core values. If you’re a monochronic person in a polychronic environment, where everything seems to be happening at once, you’re going to be frustrated initially. If you favor straightforward communication, and you find yourself dealing with people who never say “no” directly, you’ll have even more problems. Newcomers to the United States also experience culture shock, as their own core values come under assault from aspects of American society. Thai students in the United States, for example, report adjustment problems which center around several differences in core values: the U.S. concern for independence and control versus the Thai emphasis on interdependence and acceptance; American openness vs. Thai restraint; the U.S. emphasis on equality versus the Thai respect for hierarchy; and so on. Businessmen from overseas are often bewildered at the intricacy of male-female relationships in our society, and by our complex but unspoken rules governing time, status, and gift-giving. They may not understand the subtle cues which help Americans decide when to talk business and when to relax, when people are sincere and when they are just being polite. Imagine a professional meeting beginning like this: a woman enters an office and introduces herself, extending her hand to shake only to have him kiss it. Next, he helps her off with her coat and takes her by the arm to usher her over to a chair three feet away. He then comments what a pleasure it is to have such an attractive visitor. This is the Polish way; she could sue for it in the United States. •You can leave, and go somewhere more to your liking. 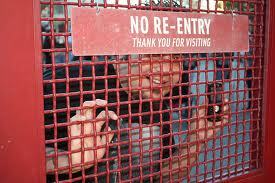 •You can ignore the new situation, pretend it doesn’t exist, and try to erect walls or barriers to isolate yourself. •You can try to change the environment itself and the people in it, so that the situation becomes one that you’re more comfortable with. •You can change your expectations. If the new environment can’t or won’t give you what you want, you change what you want. •You can become part of the situation. You can embrace the new environment, learn how it works, and start to operate within it. Not everyone sees this as important: There are expatriates overseas who have managed to isolate and insulate themselves from the culture. They inhabit what one friend of mine calls a “duty-free environment” where virtually no sustained contact takes place with the world outside the walls. • Flexibility/adaptability: a willingness to bend, to try new things, and to change routines and patterns as a result of learning. • Tolerance and patience: tolerance not just for difference, but for the ambiguity and mixed signals that are so much a part of the start of a cross cultural experience, coupled with the patience to let meanings emerge slowly, as experiences accumulate. • A sense of humor: the ability to laugh at oneself and — tactfully — at others is very important for keeping you from becoming too frustrated, angry, or serious. • Intellectual and social curiosity: a genuine desire to know more about people and their way of life, their ideas, and their hopes and fears. • Self-confidence and control: a centered and confident individual will be able to take risks and manage the stress, discomfort, and vulnerability that is an inevitable part of the early stage of cross-cultural learning. • The ability to communicate: this is not just-or even primarily — about words. It’s about the communication of respect, and the management of personal encounters in ways which are perceived by people as fair and proper. Making a cross-cultural transition is an unparalleled opportunity to enhance and extend your existing skills, and to learn new ones. Being able to adapt successfully to living and working in another culture will enable you to learn about that culture and how to operate within it. This ability, in turn, will develop in you the elements of a cross-cultural mindset that we’ve noted above. Having this mindset as part of your personal inventory will then enable you to manage difference positively and productively forever afterward. K. Oberg 1960, “Cultural Shock: Adjustment to New Cultural Environments,” Practical Anthropology 7: 177-82. Nancy J. Adler, International Dimensions of Organizational Behavior ( Boston: Kent International Business Series, Kent Publishing, 1986). Linda E. Anderson 1994. “A New Look at an Old Construct: CrossCultural Adaptation,” International Journal of Intercultural Relations 18, 3: 293-328. Quoted in David K. Shipler, “After They Defect,” New York Times Magazine ( December 7, 1986): 111. Richard W. Brislin, Cross-Cultural Encounters (Elmsford, NY: Pergamon 1981): 153.